Every one of us influences the people around us – the people who touch our lives. The question is – are we influencing others positively or negatively? Are we helping those around us to be better people? To have more integrity? To treat others with respect? To forgive? To love? We not only influence others, the people around us also influence us. So who are we surrounding ourselves with? What kind of people do we allow into our lives to influence us? 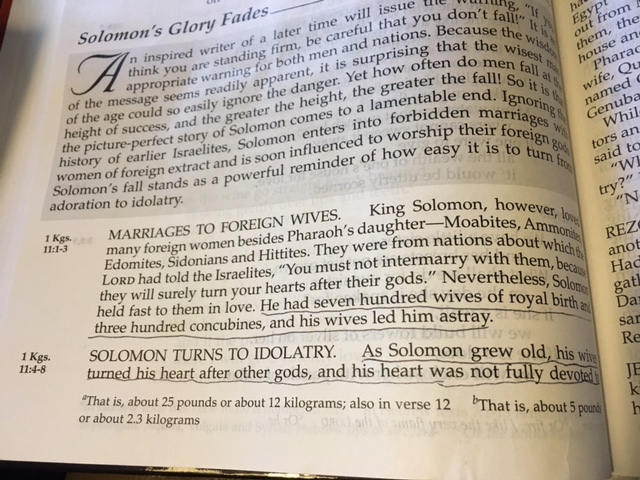 In 1 Kings 11 we read the unfortunate story about how King Solomon, the wisest man who ever lived, was turned away from being faithful to the One True God by his foreign wives. He let these women with false beliefs influence him and this made God very angry. Solomon had it all and he lost his standing with God because of who he listened to – who he surrounded himself with. Right now is a great time for us to take a look at who we are letting influence us and what kind of influence we are having on others. Please open our eyes, Abba Father.